So since the weather here has been hovering in and around Freezing for the last 4 months I finally decided to get a Seat cover for the Scooter, if you have read anything from before then you know that this particular scooter has less than 10 dollars invested into it. So keeping to that, I managed to find a Sheep Skin Car seat cover the other day, that does not exactly fit well, but it does keep the buns nice a toasty when I have to go start it up in the frosty ill gotten mornings. While walking around Inchon the other I found a most bizarre three wheeled scooter. It has radio, roof, windshield wipers, a seat warmer and even a place to hold you coffee. It was called a Season 125cc. However it is an obscure brand name. so after a little searching on the internet I found that these are more popular in Japan and Korea than anywhere else. I asked the fellow about the scooter. He managed enough broken English to tell me that the scooter was a replacement for his car since he and his wife live alone they no longer need a car or the expensive insurance that goes along with it. He apparently traded his car even for the Scooter in summer. They also sell clear vinyl side covers with magnetic snaps that act as doors to keep you dry in monsoon season. It might as well be a car with as many bells and whistles it had on it, but with the 125cc engine it gets about 90 miles per gallon, and not many cars can claim that. I have been looking around for another scooter project that can keep be interested while im here. I have a plenty to choose from being that there at least 6 in the area that are abandoned due to the scooters missing parts or repair work being needed. It will prove hard to properly work on the scooters with the tools I have at had, being a small but nice set of sockets and some few adjustable wrenches. Most of the parts that I find for the scooter are just trashed part from the scooter mechanics place that is conveniently located across the street. Its not much of a part bin but they have a few nice things every now and then. I have however been figuring ways to attach a 125cc engine onto my frame. With my 50cc I am toping out at 40ish mile per hour, this is after taking off the variator and cleaning out the carb. I believe that if I can manage to attach the 125cc I will top out at a clean 60mph. 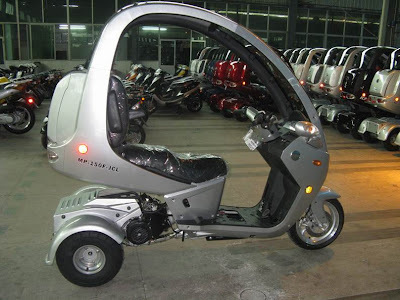 which will give me the ability to get out of the larger cities and visit the southern end of this country via scooter. The train ride is around 40.00 but I much rather drive it myself. Reminds me of that wheel vehicle that General Grievous rides around on in Episode 3.